Andrue: This week in development it’s been a Camera Script fight to the death! Two styles, one victor! Which will win?? A major overhaul to the Rover’s Movement script was introduced, but the spider-rover addition was quickly patched. RIP spiderrover. Also new is the Dark Side of the Moon..err…asteroid! Complete darkness is now (anti? )-visible where the sun-don’t-shine so be sure not to forget your rover spotlight when you head out! Next up on the menu is Solar Energy and Battery Power! Stay tuned! 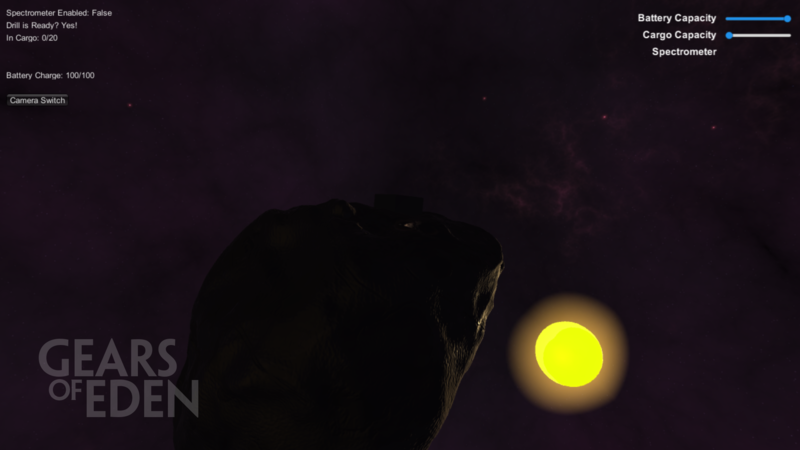 Volvary: A camera update, various bugs fixes, some dragonfli- eh… ​_Someone is telling me there is no dragonflies in space. What were those then? In all seriousness, the camera is reworked and should be fully functional for what is implemented yet, multiple smaller bugs were squashed and the next part is planned to be done. Full speed ahead! Eric: Right now the big, pie-in-the-sky goal that we’re working on is a sort of “proof of concept” demo that we’ll demonstrate the style of the game, the mechanics, and a bit of story through. This is meant to prove to us that our endgame goals are attainable and to give us something for possible investors to actually play with (rather than just saying “hey, here’s our lofty goals and some sweet art, please give us money.”) This week, we made huge headway on that front by developing a skill chain! This is essentially a representation how we want this demo to teach you it’s mechanics without feeling like we’re holding your hand or throwing you off the deep end. While we’re not working on that, we’re helping our fantastic team of programmers by … bug testing! This week’s major front end development was, as you can read in Andrue and Volvary’s messages, the camera controls! Since they haven’t set up a distance limiter for it yet, I decided zoom waaaaaay out check out the test-asteroid for this week’s image. One last thing before we go, I want to give a big shout out to Mike. He joined our team while the rest of us were on Spring Break and he has already done some great design work and personally saved me on Dev Update #3 when a blizzard knocked out out my electricity for over 24 hours!